Find and compare the best prices from a range of well known car rental companies at Skiathos Airport. This is a free to use facility, enabeling you to book direct with the company quoting the price. Skiathos airport was built in the early 1970s. The runway, at 1600m, is not the longest you will find but is sufficient. Due to the short runway, some flights leaving the island will take-off with a light fuel load, necessitating a stop to refuel. Taxis are available, the 10 minute journehy into Skiathos town costing around 15 Euros. 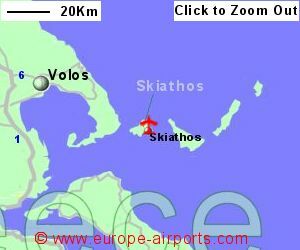 Facilities at Skiathos airport include 2 bars/cafes/restaurants, shop, and FREE WiFi Internet access. 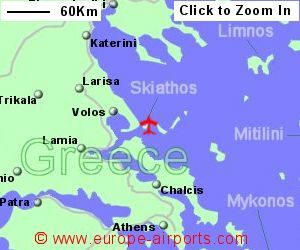 425,000 passengers passed through Skiathos airport in 2017, an increase of 5% from the previous year.